Metabolic plasticity enables organisms to respond and adapt to changes in their environment. While the core components of most pathways of intermediary metabolism have long been describe d – consisting of ~3000 metabolic genes organized in pathways interconnected by 1000s of shared metabolites ­–, it remains poorly understood how the flow of these metabolites is rewired in different metabolic states. This question is particularly relevant in the context of tumors, as cancer cells are frequently starved for nutrients and exposed to toxic waste products due to a combination of increased nutrient consumption and dysfunctional vasculature. 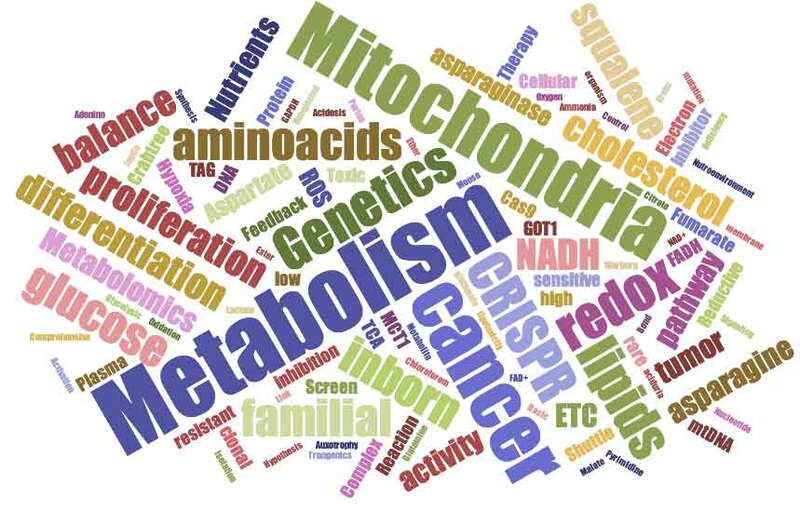 Exploring cancer metabolism also provides a tractable system to address a more fundamental question of how metabolic pathways and extracellular cues cooperate to meet the energetic and biosynthetic needs of cells at different metabolic states of metabolic diseases. In the Birsoy lab, we combine a number of cutting-edge techniques – from the development of forward genetics tools (i.e. CRISPR-Cas9 technology) to metabolomics – to elucidate how cellular metabolism contributes to human disorders such as cancer and inborn errors of metabolism. Our long term research goal is to understand how metabolic pathways in mammalian cells are rewired by their nutrient environment and, further, to determine whether these pathways present metabolic liabilities that could be exploited for disease therapy. The mitochondrial electron transport chain (ETC) consists of four enzyme complexes that transfer electrons from donors like NADH to oxygen, the ultimate electron acceptor. Many metabolic pathways, including glycolysis, the TCA cycle, and beta-oxidation, produce the electron donors that fuel the ETC. In turn, ETC activity impacts a variety of processes beyond energy balance, such as reactive oxygen species (ROS) production, the redox state, mitochondrial membrane potential, mitochondrial protein import, cell death, and signaling. Dysfunctional ETC is involved in diverse pathologies like cancer and neurodegeneration but in most cases it is unclear how ETC dysfunction leads to the specific symptom. We recently found that the key function of ETC in cell proliferation is aspartate synthesis. Building upon this observation, our lab aims to understand how ETC dysfunction influences cellular process and results in diverse disease pathologies of cancer and mitochondrial disorders. Identification of nutrient dependencies of cancer cells. Cancer is a highly heterogeneous disease with different tumor types carrying different mutations and often displaying markedly different responses to treatment. There are about 5000 metabolites in the human serum and different cancers likely show different dependences to these metabolites. To study this question systematically, we aim to map the nutrient responses of cancer cells. This work will reveal a plethora of previously unappreciated metabolic liabilities of cancer cells. The next steps will be to identify molecular basis for these dependencies, associate them with genome and gene expression profiles, uncover heretofore-unidentified metabolic programs and determine potential druggable targets. Toxic accumulation of metabolites and metabolite intermediates is commonly observed in metabolic disorders. Acute or progressive accumulation of toxic compounds can occur due to a metabolic block but also high plasma levels of particular metabolites (i.e. lipotoxicity, vitamin A toxicity). Even though the etiology of these disorders is well characterized, it is unclear why accumulation of certain metabolites is toxic and whether cells can adapt to the metabolite overload. We aim to uncover the molecular basis for the metabolite toxicity but also identify molecular pathways most important for coping with the toxic metabolite accumulation.